That's how I interpreted it all, anyway, and that's how I'll continue to interpret it, because I'm not going to get upset at some random commentator for a silly, ignorant comment. I'm a rabid Fanyu, but not that rabid. I'll save my anger for the real offenders, the ones with the comments that feel actually malicious (French commentators, grrr!). It's discussed more in the short program thread, just check the last 10 pages or so. We watched the entire event and Origin was actually great, better than Helsinki when it comes to small details. 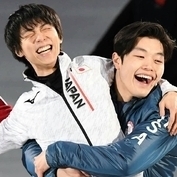 For me too the worst part is seeing Yuzu upset, but I came to a conclusion that he is a top athlete from head to toe, so this attitude can't be changed after so many years, we can only accept it (and cheer for him and sent supportive messages on banners/cards to give him even more power). At least he now tries to give himself some credit when it's due. I still need to catch up with the FS thread. But I agree with @Lunna and @MoriaPolonius that Origin seemed really great when it comes to details, I loved the performance in Moscow! The longer and deeper ina bauer was beautiful or I love the part when he leans back (after picking down the stars from the sky- at least that's how I call the little choreographic detail before he leans back:D). Amazing how he was able to fight and skated to the free skate with the injury and because of that, a completely different layout He's just fantastic.